Right on the heels of the launch of the SJP Collection, Nine West launches their Spring 2014 shoe collaboration with InStyle magazine. 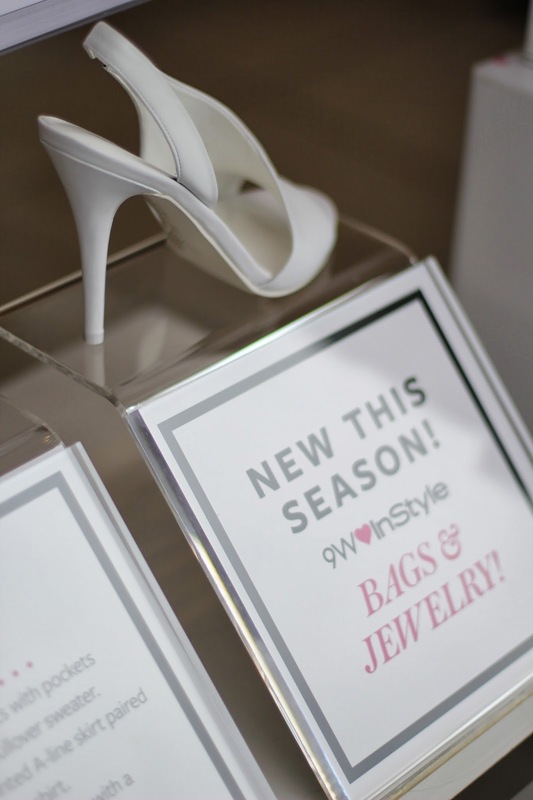 Carlis from SpicyCandyDC and I stopped by our local Nine West in Georgetown to see the collection in person. This is the second season Nine West has partnered with InStyle to create a unique editor-designed collection. The first 9W♥InStyle capsule collection in Fall 2013 has since been expanded to include accessories - featuring not only sandals and pumps but also cuffs and clutches inspired by runway trends. The Spring 2014 footwear collection offers a sophisticated approach to the season’s shoe must-haves; incorporating editorial touches such as elevated heel heights, seasonal colors, and premium materials. My obvious favorite from the collection is the Gamin D'Orsay heels in red leather. I have wide feet and normally don't d'orsay but these heels looked great on. At first, they felt a little tight on the sides, but the longer they were on, the more comfortable they felt - some shoes just need to be broken in. I love how the cutaway arch and the low side vamp make legs look longer and sleeker. If you love the collection but aren't sure what to wear with them, see the April issue of InStyle magazine which will include a 12-page editorial styling booklet featuring expert tips and guidelines from InStyle’s editors. The limited-edition collection is available in all US boutiques as well as on NineWest.com and in select stores in Canada, Spain, United Kingdom, Turkey, and Mexico.